The pattern of streets and squares has a greater impact on a city than any other element of its arrangement. Patterns have changed frequently since the first cities were established 10,000 years ago. Changes are driven by a multitude of influences, of which the most important are: values, philosophy, systems of government, population size, artistic sensibility, design techniques, building methods, paving techniques, and transport technology. Many writers on urban form seem predisposed towards the rigid grid form and often find grids where they exist only in an approximate form. These same writers tend to associate grids with planning and design. They often assume that the absence of a grid is evidence of the absence of planning. 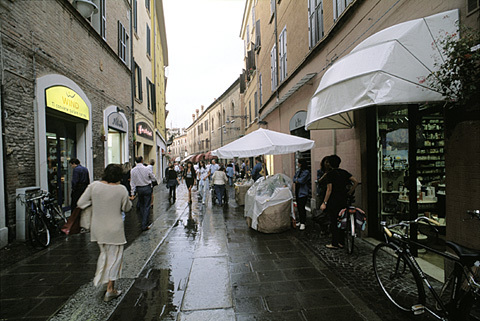 The current author argues that the complex patterns of streets in medieval districts are neither random nor chaotic. It is further argued that the grid is less well suited to application in carfree cities than medieval patterns, which provide efficient radial routes to goods, services, and transport located at the center of the district. This paper was originally written as part of a chapter in Carfree Design Manual (publication expected in 2006). Late in the writing of the book, I realized that the material now in this paper was only tangentially relevant to the book, and so it was heavily condensed in the final draft. I thought, however, that the topic was sufficiently interesting that the original text should be published. Hence this paper. 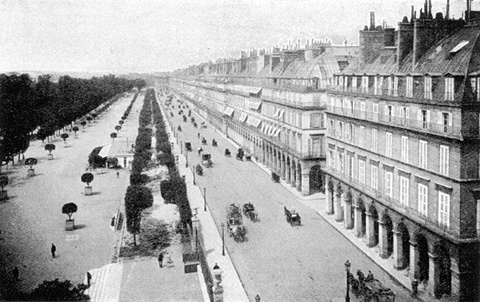 The form of cities is influenced more by the arrangement of their streets and squares than by any other consideration. City form has changed dramatically through the ages. A wide variety of circumstances is expressed in the form ultimately chosen, including: values, philosophy, population size, systems of government, artistic sensibility, design techniques, building methods, paving techniques, transport technology, sewage and waste disposal, and energy supply. These factors affect the topology, geometry, and width of the streets. I use "topology" in the mathematical sense, having to do most importantly with the network of streets--the places at which they connect to one another. By "geometry," I mean the shape of the streets, as would be recorded by a surveyor. The number of possible solutions is limited. What is curious is that certain arrangements have come and gone through history. The two principal types are the gridiron and the loosely radial arrangements centered on the principal square or squares in medieval towns as well as the cities of Athens and Rome in ancient times. This is by no means an attempt to recapitulate the 10,000-year history of the forms of urban settlements. I do believe that the evolution of city design during the past 500 years has brought us poorer, not richer environments. In my forthcoming Carfree Design Manual, what I am in fact proposing is largely a return to laying out urban areas in the ways that were used a millennium ago. This is such a dramatic break with contemporary practice that I spent considerable time researching the historical evolution of city form, as I felt that I owed the reader an in-depth justification for this change. I ultimately decided that the long text I had written on this subject was not useful in the book, which will contain only a brief synopsis. For those who want to know how I arrived at my conclusions, I offer this paper. I propose to abandon the regular geometric street patterns widely used since the Renaissance and return to the irregular arrangements of medieval times, as typified by this narrow medieval street in Siena. We will, therefore, be considering the history of the urban form in the context of street plans from antiquity to the present day. Gridiron patterns vary quite a good deal. Sometimes, as in Manhattan, they are strictly regular (above 14th Street), with perfectly straight streets and intersections at exactly right angles. In other cases, the street layouts are, topologically, still grids, but the streets neither intersect at right angles nor are perfectly straight or parallel. Blocks are sometimes rectangular, sometimes square. Geometrically-regular schemes other than grids have been proposed from time to time, and a number of them were actually built during the Renaissance. Geometric schemes provide nothing more important than simple order, in the classical sense. Straight streets and the grid often express the power of a ruler and his will to impose his chosen order. Often, there is little more substance to the arrangement than that. Grids lack the opportunities for creative expression and adaptation to the demands and opportunities of the site that are possible if a less regular scheme is accepted. I believe that the informal, irregular street arrangements often arose when paths turned into streets as people began to erect buildings along them. In hilly country, paths that have been beaten by humans and animals usually hold the maximum grade to near its lowest practical value. In so doing, they follow the contours of the site. In flat terrain, drainage features and soft soils similarly constrain the location of paths and usually favor firmer soils and drier sites. Beaten paths usually take interesting and pleasant shapes. The course of a beaten path is almost never straight but is by no means random. Many things come into play, and even among humans the mechanisms are mainly unconscious. It is often claimed that the grid is in some way democratic, that it is an egalitarian form. However, given the extensive application of the grid form by absolute rulers, Spiro Kostof found little merit in this argument and cites numerous examples of absolute rulers establishing towns on a grid plan. [Kostof (1991), 99-100] The actual motives for grid-based plans are diverse, ranging from military necessity, capitalist expediency, religious symbolism, aesthetic preference, and simple haste. For some writers, the grid is synonymous with urban planning; the absence of a grid is taken as evidence of chaotic, unplanned development. A.E.J. Morris says, "A gridiron layout cannot just happen--in direct contrast to organic growth it must be consciously determined and applied to the chosen site." [Morris, 15] Why this is intrinsically better is not made clear, and it is not a given that an organic form is accidental or unconscious. From whence does his preference for the grid come? Both grids and irregular forms can be seen in San Francisco. Grid were imposed upon most of the city, but in the steepest areas, irregular plans were developed that allowed the slopes to be mounted at more manageable grades. Where the grid plan was imposed on steep terrain, we see extremely steep, dangerous streets, with gradients approaching 20%. It is simply insane to build vehicular streets this steep. 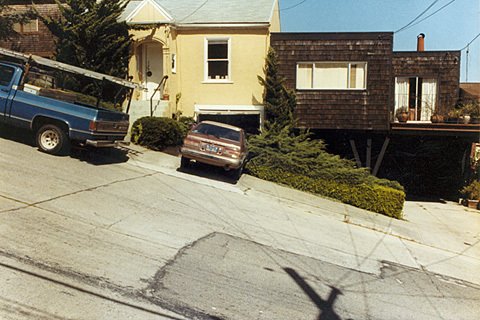 When very steep streets cannot be avoided, they can be built with stairs, foreclosing their use by vehicles. 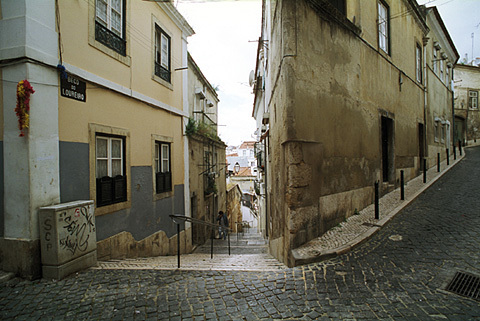 A sinuous street alignment allows a grade to be mounted at a moderate angle; stairways that shortcut the long switchbacks are appreciated by pedestrians, as in Lisbon’s Moorish Alfama quarter. Notwithstanding the association of grids with planning, not all planned areas are gridded. In fact, contemporary US sprawl development is rarely gridded. The tracts are laid out in a cul-de-sac maze, which eliminates through traffic on most streets. The streets are usually curved and sometimes respect topography. In all other respects, they’re a disaster. They presume that all travel is by car and often omit sidewalks entirely, even though there is always ample room for them. People walking or cycling must make long detours to reach many nearby destinations, as the web of connections is weak, and no rights-of-way were left for a connecting network of paths. (The topology chosen is highly ineffective for non-motorized transport modes.) Kids then often cut through yards and are accused by the owners of the heinous crime of "trespassing on private property." Aside from this important exception, most city design since the Renaissance adopted the grid. This reached a height during the US westward expansion, when hundreds of gridded towns were platted along the railroads. (In many cases, the exact same plan was repetitively stamped onto the land.) This was a matter of expedience, but these towns almost all still have their original street network--once established, streets are not often changed. It is, alas, uncomfortable to rely on the accuracy of street plans as given in many texts. Minor irregularities in the line of a street may greatly affect its appearance from the street, and errors that seem slight in plan may have important effects in reality. Many town plans depict the streets both straighter and wider than they are. Morris gives an example of the plan of Monpazier "based on over-regularised versions of the actual layout." [Morris, 87] His own plan shows less regularity than the plan he criticizes, but should a plan be regularized at all? I would argue, certainly not. Why this need to regularize a somewhat irregular reality? What is it about imperfect grids that so upsets some urban historians? Are they simply grasping at "planning" and can see no other form of planning than grids? The influence of military concerns on street layout has often been large. Military thinkers have sometimes preferred the grid and sometimes radial arrangements. The radial form came to be favored by Renaissance military strategists, and their concerns often overwhelmed other design issues. A late 15th-century radial plan by Francesco di Giorgio Martini was the first workable scheme, with a large public space in the center and radial streets leading alternately to bastions and gates in between. [Kostof (1991), 189-190] A continuous spiral street (up to the top of the central hill) also completes the web of connections between the steeper radial streets. The Harappan cities of the Indus Valley, founded from 2150 BCE onward, had streets at approximately right angles, what Morris calls "more or less regular gridiron layouts." His plans show rather less than more regularity. [Morris, 14-18] There may be good reasons to diverge from perfect regularity, especially in regards the straight street. Why do we so often find close approaches to a perfect grid in cities more than about 500 years old? 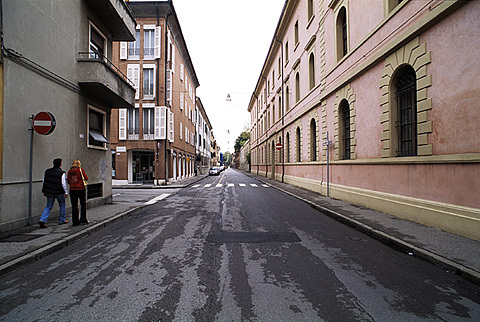 One likely answer is simply the desire to create a sense of enclosure; slight articulations of narrow streets are sufficient to create full enclosure, as can be seen here on the Via Garibaldi in the medieval quarter of Ferrara. As always, the last word goes to Leonardo da Vinci. At the height of the Italian Renaissance, he drew a plan for Imola that has grid-like features, but most of the streets are slightly curved. He would only have arranged a town in this way if he felt it to be a better form than a pure grid. Once established, street alignments resist short-term change, but changes over a span of centuries are more common. Many Roman colonial towns saw major changes in their street plans long after their establishment, sometimes following centuries of abandonment. In some cases the principal streets were retained in roughly their original form; the other streets are highly irregular. These forces led to a nearly complete breakdown of many Greek and Roman grids. Likewise, the city of Dura Europos, on the frontier of modern-day Syria, was given a regular layout in Alexandrine times but soon reverted to an irregular plan. [Kostof (1991), 105] Morris, in a note accompanying a plan of medieval Chichester, says, "As re-established however, the main axial crossings of the cardo and decumanus formed the basis of the layout; other minor streets have also followed the original gridiron to varying extents." [Morris, 75] However, the plan shown is anything but a grid. The main streets may approximate the Roman plan, but there are no unbroken straight streets and many are frankly curved.
. . . The present infatuation for making streets straight is really curious. No trouble or expense is thought too great to effect this object. . . . There seems to be an idea that a straight line is the perfection of art. But it is not a beautiful thing. Nature abhors it. In Greek temples there is not a single straight line; when statues are placed beside them their pedestals are often a little out of square. Streets seem often to be laid out on the idea that we are to look down on them as if we were birds in the air or up in a balloon. The view we get of them from this position is so rare that it need not be taken into account. Having considered a few of the issues that have affected city design in every era, we turn now to an examination of city form during the principal epochs of Western history. (Oriental history is undoubtedly equally interesting and informative, but I lacked the resources to extend this survey to include it. Likewise, the histories of pre-Columbian Latin America and Africa are omitted.) We will be seeking enlightenment regarding the geometry of street layouts and the design methods that were applied through the ages. I was stunned when I read this. Zucker praises the great designs of the Renaissance and Baroque, a time when urban spaces with powerfully-expressed axes were the norm. This is, of course, the era of nation-states and absolute monarchs, whose power enabled favored designers to execute their plans. Rigidly-gridded Priene was arranged with the major streets running approximately parallel with the contours of the site and the minor streets running fairly steeply up hill. This led, however, to a low corner of the site having rather steep streets in both directions. Erbil is a walled town atop a huge earth mound. A 1944 sketch map shows the major streets converging on the Big Gate. The only other entrance appears to be the Small Gate, about a quarter of the way around; only one street leads to it, which suggests that this gate may be a comparatively recent addition. No great genius was needed to think out this method. Groups of colonists were constantly being confronted, after hitting on their site, with the problem how to divide up the group most easily and conveniently and to the greatest general satisfaction. The rectangular method meant the least complications. . . . The "gridiron" served their purposes well enough. They made no pretence of aiming at grandiose or picturesque effects, splendid vistas and the like. . . . However, Bacon concerns himself mostly with the main public spaces and seems to assume that the rigid gridiron in the residential areas is of concern only as a foil for the public spaces. This focus on the public realm is typically Greek and yielded some fine urban spaces, but it may have given short shrift to those parts of the city where people passed most of their time. "Medieval" encompasses both the dark and middle ages. Morris (82) and Zucker (63) take this period as the 9th to 15th centuries. Henri Pirenne thinks that Roman ways only disappeared when Mediterranean shipping ceased at the time of the Moorish invasion, in the 7th & 8th centuries. (See his Chapter I.) Many take the period to begin with the fall of Rome. I take the Renaissance to begin in Florence in 1420. Morris (104) says that architectural history divides the Renaissance into four phases: Early Renaissance (1420-1500); Late Renaissance (1500-1600); Baroque (1600-1750); Rococo or Neoclassical (1750-1900). Zucker (144) has the Baroque beginning at Michelangelo’s death in 1564. We know comparatively little about what befell cities during the long medieval age. Disasters, such as the bubonic plague that decimated Europe’s population, are tolerably well recorded, but written records for the period 410 CE (the fall of Rome) to 1300 CE are generally sparse. From the start of the Renaissance, plot and building plans began to be filed in city halls, but it is difficult to obtain much insight into changes in the urban fabric during the course of this earlier period. I take the medieval period to begin with the fall of the western Roman Empire and to end with the start of the Italian Renaissance around 1420. However, the Renaissance affected the form of only a few cities during its first century, and medieval city design continued for a long time, especially in England. Few new towns were founded in Europe until near the end of this age, and comparatively little expansion of existing towns occurred. That is not to say, however, that cities and towns did not change. Some towns were abandoned for centuries and eventually rebuilt. Most cities would have burned at least once. In the 13th and 14th centuries, hundreds of new, planned garrison towns were built, the bastides. Some writers say that the number of these towns was rather small, but Kostof says that as many as a thousand new towns were founded, more than doubling the number of towns in Europe. Several hundred were established in southwestern France alone and others in the south of Great Britain. Many were founded in Switzerland, Austria, and Germanic regions east of the Elbe, these latter usually by the Teutonic Knights. Kostof believes that this last group exhibits the most careful planning. [Kostof (1991), 110] Zucker says of the Teutonic towns that most were "regularly planned." [Zucker, 66] I do not know the extent to which rigid gridirons were imposed upon them; the few plans I have seen show imperfect grids, however. Naarden in the Netherlands is one of the few bastides I have been able to visit. While this was clearly a planned, not organic, city, its appearance owes more to organic arrangement than to the gridiron, as can be seen here. It seems that for most of this period local people generally made minor changes as the need arose; cities evolved slowly over a span of centuries. Streets were arranged by those who used them, to suit their needs and desires. These places have very few streets that are straight for any great distance, as is true of informal settlements in all times. Quite a good deal of what was built during this thousand-year period remains intact, and I have observed and photographed as much of it as I have been able. 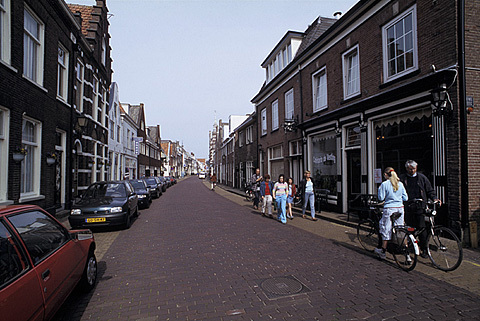 In my direct experience of these places, a street that is straight for any great distance is rare, although the degree of articulation or curvature is often slight, as in Naarden, above. Street widths vary, sometimes by jogs, sometimes by tapers. Just because there are "few recorded instances of aesthetic awareness" is no reason to presuppose its absence. Remember, these are the people who gave us most of the cathedrals we have today. Life was not so primitive during this era as we often suppose, and there was nothing wrong with the artistic sensibilities of these people. Why imagine that they brought no thought or skill to arranging their cities? We may never know for certain, but I think that there was a great deal of informal collective action; this might have taken as simple a form as neighbors chatting about their street over the years. It is otherwise difficult to account for the stunning results; they could not have arisen by chance. It is worth considering Alexander’s recent work in this regard. He has lately concerned himself with the generation problem, that is, with the design sequence applied to urban areas. He believes that the sequence of design, especially on-site design, greatly affects its outcome. [Alexander, The Nature of Order, Book II, Part Two] So, if people gradually added to their city over a period of centuries, they were engaged in a process that gave time for reflection and opportunities to correct faults. This may be an extremely important finding by Alexander. This may simply mean that, during the medieval era, people concentrated on the figure; in Renaissance times, they concentrated on the ground. Is this any basis for damning the medieval construction as "incoherent" in the first place? In fact, I don’t even think that Zucker is correct in contending that medieval design showed no concern for space. Quite the contrary. It seems that, for him, the absence of a single great mind seizing on a design in a moment of brilliance somehow represents a failure in the process of urban design. I find this very strange, and I suspect that it arises from the Modernist disease, which has The Great One casting his pearls before the swine. During the Renaissance relatively few new towns were established, but existing towns grew rapidly. Many of these extensions were planned works based on a regular grid. Completely new towns were, however, founded in Sicily, Scandinavia, and the New World. Most of these towns were fully gridded, and many included a square near the middle. [Kostof (1991), 111] There were important exceptions, however, including the original Dutch settlement of what is today New York. The area south of Wall Street remains a web of irregular streets. Some of the Scandinavian towns took a radial form. A pronounced authoritarian thread runs through this era of steadily more powerful monarchs; to this do we owe the application of rigid rules by one all-powerful figure. The results are often stunning at first glance, but most of these spaces lack a satisfying sense of evolution. (We must exclude Michelangelo’s work on the Capitoline Hill, where he improved on what he found.) Spaces designed by a single hand in the Renaissance manner are usually stiff and cool. 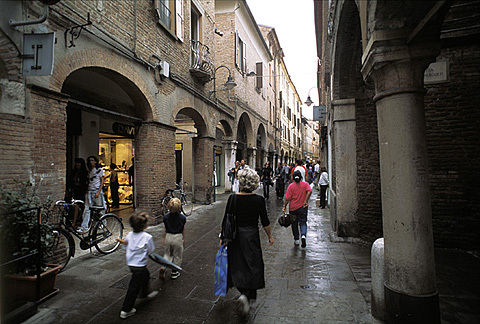 Consider the city of Ferrara, which has a large intact medieval district adjoining a similarly-sized Renaissance district. People still seem to prefer the older part of town, with its curving narrow streets. The first Renaissance building is held to be Brunelleschi’s Foundling Hospital in Florence, started in 1419. Renaissance urbanism only appears in 1470 with Genoa’s Via Nuova, so the Renaissance was slow to affect the appearance of cities. If ever a square was to become the symbol for a whole city, it certainly was St. Mark’s Square . . . in Venice, the "ballroom of Europe." . . . This is an astounding statement, coming from someone who is so disparaging of medieval city design. Finally, perhaps, he starts to understand his own "intuition rather than systematization inspired these crystallizations of the human spirit in space." [Zucker, 110] But even here Zucker chooses to overlook the fact that San Marco was in substantially its present form by the end of the middle ages. The Renaissance changes merely continued the unfolding of a form that had been laid down centuries before. Why are some people so reluctant to acknowledge the brilliance of intuition? What is wrong with deep understanding that it should be papered over by shallow order and regularity? I cannot offer an answer, but I do urge that the intuitively-correct solutions be given a chance against intellectually-"brilliant" designs created on paper. We turn now to the Baroque. While some consider it a part of the Renaissance, it is a distinct era of its own. At the very least, the expression of Renaissance ideas received a different impulse. Baroque notions remained influential into the 20th century. The ideas of René Descartes (1596-1650) greatly influenced thinking during the Baroque and later periods. The changes in the practice of city design during this era were not so vast as those which occurred during the shift from medieval to Renaissance designs. Paper plans and straight lines continued to dominate, as a reflection of Cartesian logic. Transport concerns became steadily more important as cities grew. The Baroque is the era when plans began to be imposed on a site. No longer would topography stand in the way. Kostof says that while local features were to be accurately ascertained, "these shapes were a challenge: they were to be dramatized where useful to the intentions of the planner, suppressed where they were not." [Kostof (1991), 218-219] Man began to impose his will over nature on a grand scale. Kostof says this willfulness was even "cherished." Kostof claims that the widespread adoption of coaches (in the 15th century) had a large effect on city planning. "The railroad, streetcar, and automobile city made a coherent system out of radial traffic arteries and girdle streets." (Kostof’s "girdle streets" are minor streets circling the center at a distance.) [Kostof (1991), 192] This required the definition of a strong downtown center from which the traffic arteries radiated. Kostof later says that "It can be demonstrated that a principal motive for the widening and straightening of streets in the Age of Absolutism was to ease the passage and parking of coaches in the old urban cores." [Kostof (1991), 231] In some cities, diagonal streets were added, to strike through a regular grid. This is characteristic of Baroque planning. There is no question regarding the depth of the commitment to straight streets. The City Museum in Lisbon exhibits several plans developed for the Marquis de Pombal after the devastating 1755 earthquake. The Baixa, a flat area sloping gently up from the Tejo (Tagus) River, had always been the heart of the city, and it was levelled by the shake, tsunami, and ensuing fire. It had developed the usual web of streets converging on the principal square. 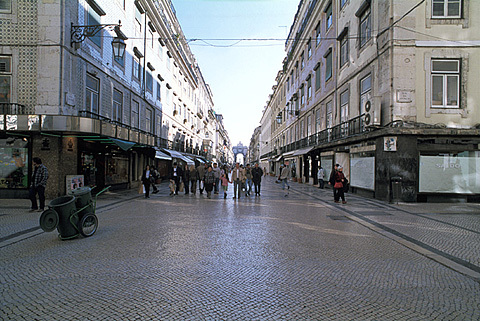 Pombal, driven by exigencies, chose the rectilinear version from among the proposals, and this plan can still be seen in much the same form today, as here on the Rua Augusta. The rigidity of the plan is relieved by the varying distance between parallel streets and the differing widths of the streets themselves. It is interesting to note that Pombal elected to retain the old street plans in the hills on either side of the Baixa, where the destruction was only partial, and this, too, is still visible today. So not all of it was Palladio and his "dead rules" after all. Some of this work has real heart in it. The principles of Baroque planning have fallen in and out of favor over the past four centuries. L’Enfant’s plan for Washington shows powerful Baroque elements, as did the plans of the US City Beautiful movement early in the 20th century. The "modern" era was already well under way by the time industrialization began to influence cities. However, "Modern" architecture arose about a century after the start of industrialization, in part as a response to it. Indeed, industrialization jolted urban planning and design. High-grade, standardized materials became widely available at low prices. Unfortunately, the effect of industrialization on city design was mainly adverse. To begin with, the production of the materials themselves came at terrible costs. The countryside was ravaged to supply hitherto inconceivable quantities of raw materials. Forests vanished. Skies were darkened by smokestacks belching coal smoke. The ecological costs of industrialization were, in many ways, worst at the beginning, when steam engines were inefficient, electricity was still generations away, and pollution controls were as yet unimagined. The blight that afflicted Britain, the first industrial nation, was horrific. It was exacerbated when tenant farmers were forced off the lands they had tilled for generations and driven to work in the mills and live in fearfully overcrowded workers’ housing at the skirts of the mills and in the lee of their smokestacks. This began the modern era, in which anything that could not be bought and sold was held to be of no real value. Jonathan Hale traces the steady decline in the design skills of ordinary people to the beginning of the industrial era. [Hale, The Old Way of Seeing] Just what might have caused this is a matter of speculation. What cannot be doubted is that living conditions UK cities declined sharply during the 19th century. The situation was not much better in other industrializing nations. The impact of industrialization was not entirely negative for cities, however. Inventions such as the railroad, water treatment, gas lighting, and electricity made larger cities possible and thus enabled the phenomenal growth in knowledge that continues to this day. Not all urban design of the period had the depressing character of mill-workers’ housing; some very fine urban areas were built in 19th century, many of them still popular today. Now, during the last third of the [18th] century, "neoclassicism" corroded [the feeling for three-dimensional expanse]. The susceptibility for the third dimension diminished till it finally vanished entirely at the beginning of the nineteenth century, the "flat" century which was interested only in two-dimensional design. The triumph of reason became complete; architecture and city planning followed essentially structural concepts. A logical, almost functional approach rather than the desire to express three-dimensional imagination directed the creative process. . . . Simplicity in contrast to richness and variety of expression became the ideal, and it was this ideal which writers and artists saw primarily in the works of antiquity. The beginning of systematic archaeological studies in Greece and the excavations in Pompeii and Herculaneum . . . stimulated the study of antiquity again--led, in fact, to another Renaissance, although one that was dryer and more theoretical . . . .
Sitte continues to explain, using the example of an arcade, why the creation of enclosure had become impossible. 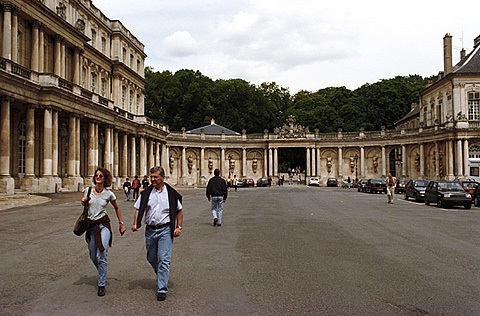 (See, for example, Paris’s Rue de Rivoli, given by Raymond Unwin.) It has simply to do with the breadth of the streets. Each block stands out distinctly; the repeating arches of the arcade can no longer create enclosure because they are separated by such wide streets. The continuity required to create enclosure can no longer be developed. Medieval comfort has been sacrificed to transport requirements. The best that can be had is monumentality. [Sitte, 86-87] Of course, the situation became even worse once the space requirements of automobiles came to dominate city design. This spoke to the British soul, which had remained stubbornly pastoral--the aristocracy had its estates and mansions, and the working class deserved its own miniature versions. In English-speaking lands, echoes of this urge still prevail, and the suburban house standing on its own plot is still widely considered the most desirable form of housing in these countries. This is a crucial point, and he has clearly attempted to express this lesson in his own work, with some success. So, although Unwin gave us no Garden Cities of a medieval character, his understanding and thoughtful analysis of medieval streets and squares in the modern context remains useful. In the 20th century, the accumulated wisdom of architecture and city design was not merely forgotten, it was reviled. Modernism took a perverse pride in breaking with thought and design from all prior epochs. It was based on a presumed need to completely reinvent culture to suit the dawning new age. The end of Modernism is placed by some at the demolition of the failed Modernist Pruitt-Igoe housing project in 1972, but it can reasonably be argued that Modernism is with us still. Modernism was a response to industrialization, to the era in which the mass production of standardized products really began to affect the world. This was a time of great optimism, a time when technology was expected to end hunger, clean up squalor, and eliminate ugliness. Architects would lead the charge: the Bauhaus, "starting from zero," would reinvent architecture. Modernism relied upon designs that used large numbers of cheap, identical, machine-made parts. Given the imperative of standardized parts, it was necessary to seek an uplifting style based on endlessly repeated elements. 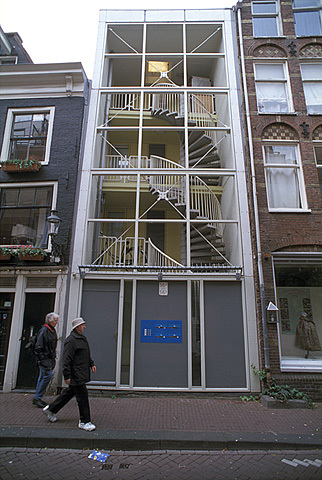 To give credit where it is due, a few early efforts were modestly successful in this regard, and even some recent buildings are not entirely without merit, such as the misplaced house above, in Amsterdam’s Jordaan district. Modernism took up the automobile as an icon for the era. (Corbusier reportedly specified that a car was to be parked in front of his buildings when completion photographs were taken.) Modern architecture and city design are wedded to the automobile, which was to bring freedom to all. This led directly to Corbusier’s towers-in-a-park scheme, with broad highways connecting different parts of the city. Corbusier proposed to demolish vast swathes of central Paris to impose his broad highways and towers-in-a-park. This alienating concept was adopted with disastrous results in the post-war era. Ultimately, of course, every attempt to meet the demand for road space in large auto-centric cities proved inadequate. The view of the automobile as an ideal mode of urban transportation was disconnected from reality in ways that would become increasingly familiar as Modernism became ever more threadbare. Modernism was given a providential boost by Hitler when he kicked the Bauhaus out of Germany. His pet architect, Albert Speer, promoted a brutal German classicism. And so, in a fateful turn of history, classical architecture came to be associated with fascism, and the Modernists, many of whom were equally absolutist, were seen as the defenders of democracy. Once Hitler had been crushed, they knew no bounds. The arrogance characteristic of so many Modern architects is probably most evident in Corbusier and Philip Johnson (himself a one-time Nazi supporter). What is most ironic is that the Bauhaus had its roots in socialism, in the concern for the welfare of the worker. But the fatal flaw was elitist socialism: all-knowing architects would design perfect buildings for the masses, who ought then to appreciate them. Modernism increasingly developed into a pure intellectual exercise: the buildings were great because the thoughts behind them were great. As Modernism devolved into Post-Modernism and Deconstructivism, this reached absurd proportions. Mathematical concepts, such as fractals, were seized upon by architects, who had no idea what a fractal actually was. (For an explanation of what a fractal actually is, see: Nikos A. Salingaros, "Fractals in the New Architecture") They took it to mean "broken-edged," and a rash of buildings, like the Guggenheim Museum in Bilbao, appeared with rough edges. The actual number of buildings designed according to the principles of Modernism and its followers is actually fairly small. Most of what was built after WW II is not really Modernist at all, even though auto-centric planning came to hold nearly universal sway. In the USA, the vast majority of post-war houses were caricatures of early-American styles. Most commercial buildings since 1970 are engineered structures, in the sense that function and cost determine everything. The trend culminates in the "big-box" store--a giant box with a few doors. "Architecture" cannot be used in the same breath. All this comes with vast parking lots to serve "consumers" who come from far afield. These stores are normally sited on cheap land at out-of-town highway intersections. The highway has thus become the American icon, symbolizing a total, if temporary, victory of auto-centric urban planning. The New Urbanism is a reaction to the increasingly bizarre swerves of contemporary architecture and urban planning. By and large it revisits early 20th century urban forms, typified by the streetcar suburbs built in the USA in the 1920s. These were comparatively dense, close-in residential suburbs built on a grid plan and connected to downtown by new light-rail lines. The automobile was already a presence but had not yet dominated cities; it would be another decade before cars became cheap, convenient, fast, and reliable enough that city dwellers would build their lives around them. There is really nothing much wrong with the streetcar suburb as a residential form if located near a small city, and quite a lot that’s right. It is, however, distinctly suburban. I believe that the New Urbanism might more honestly call itself the Old Suburbanism. However, there are some New Urbanist architects and city designers who are true urbanists and understand and love the urban context. I am thinking of people like Léon Krier and Peter Calthorpe. As in the case of the 1920s suburbs that New Urbanism tends to emulate, it adopts the suburban grid of that era as the basis for city design. I believe that this arises not from any particular love of straight streets but from a recognition of the need for a fully-interconnected web of streets, such as the grid topology provides. In fact, a review of New Urbanist projects shows many layouts that are at least approximate topological grids, but quite a few that do not make extensive use of unbroken straight streets. New Urbanist projects always use comparatively small blocks and provide a close-knit web of streets. The New Urbanists want to restore the sense of community that was lost in American suburbs. While they understand the need to stop cars from dominating the urban scene, they have yet to accept that as long as cars remain the default transport mode and must be accommodated in planning and design, no large improvement is possible. Even the best community will find itself surrounded by busy highways. Allied with the New Urbanist movement are contemporary forms of architecture such as the "New Classicism" or "Traditional Architecture." Their exponents understand the worth of historical urban forms, including the curved street. I think the best single book is Léon Krier's Architecture: Choice or Fate. See also Lucien Steil’s "Tradition and Modernity in Contemporary Practice." We will touch only briefly on the history of urban form in a non-Western context, but the subject is fully as complex as in the West. We see in cities from Beijing to Mexico that powerful figures have throughout history preferred to arrange their cities using axial and gridded forms that express their status, power, and wealth. In freer times and places, from Asian kampongs to Brazilian favelas, groups of ordinary citizens seem always to arrange their communities in irregular shapes. Even taking the camps of the Palestinian refugees, we find that the original rectilinear arrangement of tents morphs into a complex web of streets in a single generation. We make a serious error if we assume that this rejection of the grid is a random act. It expresses a yearning for freedom and independence. It is a rejection of regimentation. I am proposing an almost complete break with the city design practices of the past half millennium, during which distant experts decided what was needed and drew up elegant plans to provide it. While some of their neighborhoods are quite fine, I believe that straight lines and repetitive shapes, the hallmark of centralized planning, are ultimately dull and unsatisfactory. I also do not believe that centralized design expresses the values of a free and democratic society. For these reasons, I propose a return to on-site design, conducted by the people who will ultimately occupy the completed neighborhood. I hope that this will ultimately return to us some of the brilliance that is to be found in medieval towns and put an end to the tyranny of plans devised on paper. Alberti, Leon Battista. On the Art of Building in Ten Books (Cambridge: MIT Press, 1988). Alexander, Christopher et al. A Pattern Language: Towns, Buildings, Construction (New York: Oxford University Press, 1977). Alexander, Christopher. The Nature of Order, Books I-IV (Berkeley: The Center for Environmental Structure, 2002-2005). Brand, Stewart. How Buildings Learn: What happens after they’re built (New York: Penguin Books, 1994). Bacon, Edmund N. Design of Cities (New York: Penguin Books, revised edition, 1974). Delfante, Charles. A Grande História da Cidade (Lisbon: Instituto Piaget, 1997; originally Grande Histoire de la Ville). Hale, Jonathan. The Old Way of Seeing: How Architecture Lost Its Magic (And How to Get It Back) (Boston: Houghton Mifflin Company, 1994). Hall, Peter. Cities of Tomorrow: An Intellectual History of Urban Planning and Design in the Twentieth Century (Oxford: Blackwell, 1988). Kostof, Spiro. The City Shaped: Urban Patterns and Meanings Through History (London: Thames and Hudson, 1991). Kostof, Spiro. The City Assembled: The Elements of Urban Form Through History (London: Thames and Hudson, 1992). Krier, Léon. Architecture: Choice or Fate (Windsor, UK: Andreas Papadakis Publisher, 1998). Morris, A.E.J. History of Urban Form: Prehistory to the Renaissance (New York: John Wiley & Sons, 1972). Olsen, Donald J. The City as a Work of Art: London, Paris, Vienna (New Haven: Yale University Press, 1986). Pirenne, Henri. Medieval Cities: Their Origins and the Revival of Trade (Princeton: Princeton University Press, 1925). Salingaros, Nikos A. "Connecting the Fractal City". (Keynote speech, 5th Biennial of towns and town planners in Europe, Barcelona, April 2003). Salingaros, Nikos A. Anti-Architecture and Deconstruction (Solingen: Umbau-Verlag, 2004). Siegel, Charles. "An Architecture for Our Time," Essays, Volume I, Number 9, at INTBAU. Sitte, Camillo. City Planning According to Artistic Principles (New York: Random House, 1965; first edition Der Städtebau nach seinen künstlerischen Grundsätzen, Vienna, 1889. Translated by George R. Collins and Christiane Crasemann Collins). Unwin, Raymond. Town Planning in Practice: An Introduction to the Art of Designing Cities and Suburbs (London: T. Fisher Unwin Ltd, revised edition, 1911; page numbers refer to the facsimile reprint from Princeton Architectural Press). Wilde, Oscar. De Profundis (Penguin). Wycherley, R.E. How the Greeks Built Cities (W.W. Norton, New York & London, 1962, 2nd edition, 1976). Zucker, Paul. Town and Square: From the Agora to the Village Green (New York: Columbia University Press, 1959).